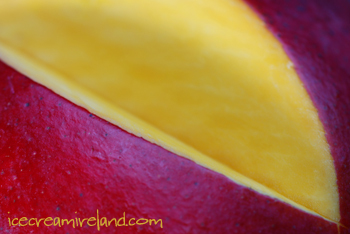 The sun’s been shining here in Dingle, and with the onset of summer, I always think about sorbets. Fresher than ice cream and completely dairy-free, sorbets are often my ice cream of choice for warm weather. Mango sorbet is one of our favourites. It’s a flavour we have chosen to sell in our 500ml tubs, and it’s rarely out of the scooping cabinets in our shops. Make it, and you’ll see why. You will, however, need fresh, soft, ripe mangos! Mangos are considered in some cultures to be a food of the gods, and in my opinion one of the sexiest fruits in the world. Smooth, juicy, and utterly delicious, eating a ripe mango is an experience to relish. It might be messy, but it’s also sensual and delivers an explosion of taste. 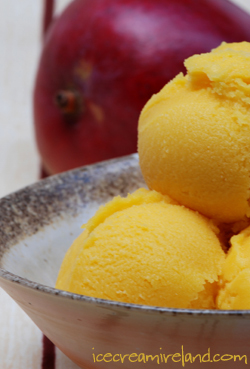 In sorbet, mangos are just as appealing. The texture of the fruit makes this frozen treat almost as creamy as an ice cream. We have made mango ice cream as well (including an award winning mango lassi flavour), but our favourite by far is this recipe, and we;re not the only ones to like it. It’s proven so popular in our shops that we have added it to the list of ice cream we supply to shops in our 500 ml tubs. Mango sorbet can be served at any time or any occasion. Well able to stand on its own, it pairs perfectly with almost any ice cream or pastry. Viable as a sorbet course, it also excels as a dessert. It is light enough to be perfect after a heavy meal and flavourful enough to satisfy if the meal is simple. I am sure this versatility is why it’s so popular with the restaurants we supply, and you can hardly go wrong including it in your own dinner menu. I might suggest that because the fruit originated in Asia, it’s especially great with Indian or Thai food. If you’ve cooked up a spicy curry, then mango sorbet served after will cool, balance and restore the taste buds as well as sweeten the evening. Add the boiling water to the sugar in a heat-proof bowl. Juice the orange and lemon. Combine the lemon and orange juice with the mango in a blender or food processor and blend thoroughly. Add to the cooled sugar syrup. Otherwise, simply place in a covered, freezer-proof container and place in the freezer, stirring everyÂ two hours to break up the ice crystals. I’ll have to try it when the weather’s back on track. I would love some RIGHT NOW! I absolutely adore your website and am so excited to try this fantastic looking recipe! I made this last week for a book club dinner party after finding myself with a bounty of fresh mangos, and now the recipe is happily residing in my personal cookbook. I have seen many recipes for sorbet here and there, but never knew if they would be worth making. 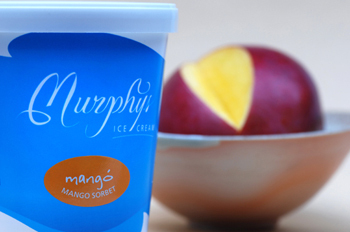 Then I saw this on your site and I thought surely I can trust the Murphys to put out a great sorbet. Thanks so much for posting your recipes! Marie from Boise, Idaho U.S.